The concept of traceability, whereby we can trace the path of agricultural products and foods in the global economy, is useful not only for ensuring the safety and quality of such products, but also for environmental studies. This utility arises because the traceability information that can be used to identify the source and origin of environmental materials is invaluable for elucidating the interactive links between human activities and natural environments such as the atmosphere, hydrosphere, biosphere, and pedosphere, and for preserving the quality of the different environmental spheres on Earth. Stable isotope ratios of heavy elements such as strontium (Sr), neodymium (Nd), and lead (Pb) in rocks and ores show large geographical variations reflecting geological processes during the evolution of the Earth and small isotopic effects during the movement of the heavy elements though the various spheres on Earth. 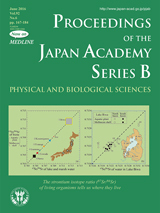 Prof. Nakano recognized the unique nature of heavy stable isotopes that originate from geological materials in the lithosphere and their potential use as a tracer of their interaction and transportation among the spheres of the Earth surface environment, and demonstrated their effectiveness in various environmental studies. This paper (pp. 167-184) discusses the potential utility of the stable isotope ratios of geological origin in ecological and environmental studies in terms of their traceability, mainly by summarizing Prof. Nakano’s extensive application of stable isotope ratios in studies of the atmospheric, aquatic, and soil–vegetation systems. 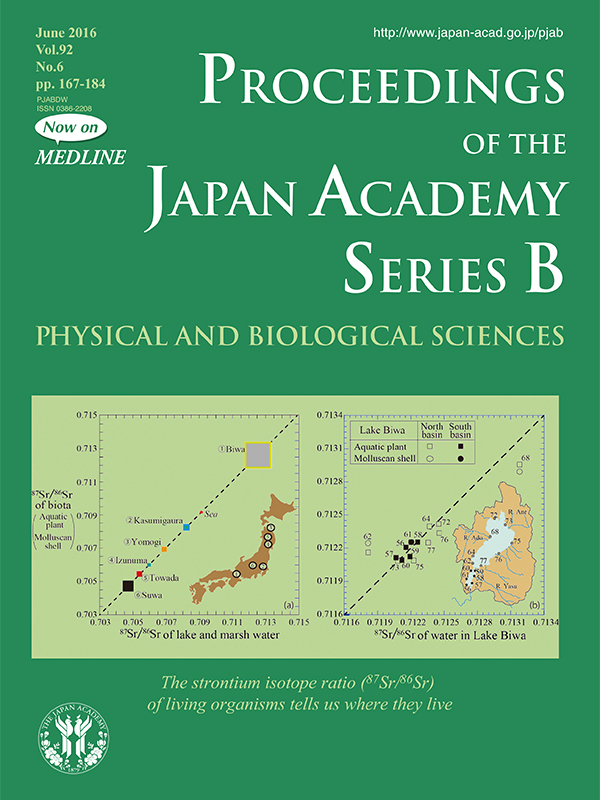 The cover diagram shows regional variations in the Sr isotope ratios of biota and ambient water in freshwater lakes (left) and in Lake Biwa (right), where local heterogeneity is observed, reflecting the inflow of tributaries with different Sr isotope ratios. This diagram demonstrates that the stable isotope ratios of Sr can be utilized as a traceability index whereby the Sr isotope ratio of biota can be largely traced back to that of the source rocks in the watershed via the lake water and inflowing river water. The spatial distribution of stable isotope ratios, called an ISOSCAPE (derived from the term “isotope landscape”), provides basic information that can be used to identify the source of atmospheric materials, water components, and agricultural products, and for studies in various fields such as hydrology, ecology, forensics, and archeology. Stable isotopes of Sr and Pb are now used for food traceability. The combined use of the stable isotopes of heavy elements and light elements will open up a new research field in global environmental studies, since the use of multiple stable isotopes is a powerful tool for traceability diagnosis with high accuracy.